Spies, soldiers, thieves, and aliens. All caught in a power play between corporations and governments to control the future of our world. A future where humanity isn't the only player, and the lines aren't as clear as you think. In a near future, something has arrived. In the asteroid belt, a secret outpost of humanity must withstand a test they are not prepared for... or all humanity will burn. 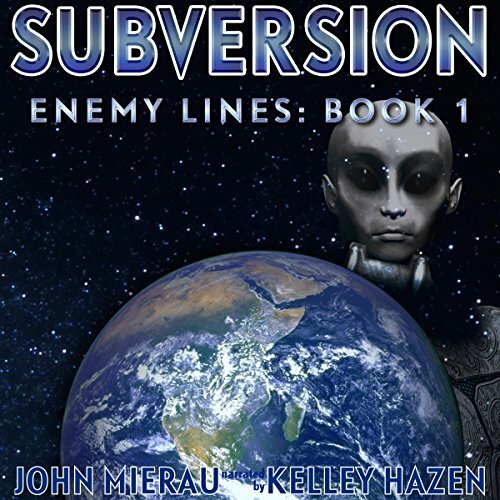 Subversion is book one in a new thriller/space opera series, Enemy Lines. That pits man against a coming reckoning at alien hands...if we can survive our own eternal greed. Great story. I'm completely hooked. I was mesmerized. All I can say is where is the next one? Where does Subversion rank among all the audiobooks you’ve listened to so far? I enjoy characters and this story is certainly full of them. Which character – as performed by Kelley Hazen – was your favorite? Kelley Hazen does a fine set of characters voices especially considering most (but not all) are males in this book. But it is as a narrator where she is nonpareil. I could listen to her read installation instructions for an after-market trailer hitch. This is filled with such fast paced action and revelations It's like a ground hornet attack, only a lot more fun. The diverse & separate story threads that obviously will connect at some point, are all interesting and really move along. There is no weak link. Sort of reminds me of Herman Wouk's Winds of War, in that respect.